The jobsalert.pk website is the most updated website about the recent and daily jobs and all sort of jobs have been posted daily basis. 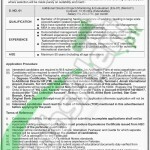 So the Public Sector Organization is knocking the doors of career opportunities for the interested and needy individuals for their better future Pakistan Civil Aviation a Public department is offering the vacant position for the post of Additional Project Director ( Monitoring & Evaluation) but the selection will be made purely on merit basis for these temporary contract base job and the duration of contract is 12th months can be extendable. The attractive salary of 294,237 will be offered to the employee. The candidate have done MBA, B.E and must be having the experience in Airport aviation, Integration of IT, Demonstrated aviation experience ISO Certified, Audit management and its works along with many experiences will be preferred for this job. Lets tap to its further details. All the candidates having 55 years age limit along with all age relaxation can apply. But the above mentioned experiences must be fulfilled. Candidates are informed to fill the online application form from the website www.caapakistan.com.pk and send the print out application form along with C.V, 2 passport size photographs,Domicile, C.N.I.C, all educational certificates are required to be sent to the Additional Director HR to the below mentioned address. The candidates submit Rs: 1000 in the favor of "HQ, CAA, Karachi" through online facility in Account#001011740150017, Account title is "CAA Collection Account" , Branch Code 0418, Allied Bank Limited Star Gate Branch, Karachi. Original deposit slip must be attached with the documents while sending to the respective address. Selected candidates may serve anywhere in Pakistan. Government employees, Autonomous employees/CAA employees serving apply through proper channel.N.O.C is mandatory for the serving employees before test/interview. No TA/DA will be permissible. Address: Additional Director HR (TM) Headquarters Civil Aviation Authority, Terminal -1 Jinnah International Airport, Karachi.